Antennas have come a long way from the rabbit ears on your old TV. 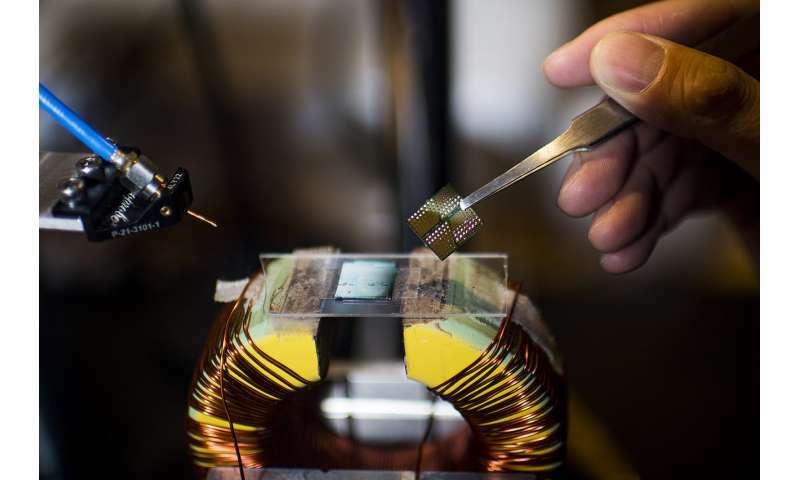 But the antenna that Northeastern doctoral student Hwaider Lin has been working on since 2015 is about 100 times smaller than the one currently in your smartphone. Lin said the antenna he is developing could eventually be used in a chip implanted in a patient's brain to help treat disorders such as depression or severe migraines. Currently, researchers use electromagnetic currents created outside a patient's head to stimulate neurons in the brain to help treat these medical conditions. But this method is imprecise. With a smaller antenna, researchers may be able to create an implant in the brain that would more precisely target specific neurons. Lin's antenna recently won first prize in design a contest run by the publishers of NASA Tech Briefs magazine. More than 800 applicants from 60 different countries submitted their technology to the "Create the Future Design Contest," which judges feats of innovative engineering in seven different categories. Lin topped the category for Electronics/Sensors/Internet of Things. "I'm kind of surprised I got the first prize," Lin said. "But I think [the antenna] is worth it." Conventional antennas send signals by bouncing electrons back and forth along a metal cable. This creates waves of electromagnetic radiation that can be picked up by other antennas tuned to the right frequency. Changing the size of the antenna changes the frequency. There's a limit to how small these antennas can be before they stop being effective. The antenna Lin has been working on starts with a different kind of wave: an acoustic one. Acoustic waves are slow-moving physical vibrations. Because of their slower speed, they can match the frequency of an electromagnetic wave, but will have a wavelength that is thousands of times smaller. This means the antenna can be smaller too. Lin's antenna is able to translate those acoustic waves into faster-moving electromagnetic ones with the same frequency. This is because the material vibrating in Lin's antenna is magnetic. "We actually do materials science first," said Lin, who works in Northeastern's Advanced Materials and Microsystems Lab. "Our material is the most important thing for this antenna." This work was first published in August 2017 in Nature Communications. Since then, Lin and his advisor, Northeastern professor Nian Sun, have been refining it to be used in different applications. "So far, the best choice is biomedical applications," Lin said. "They need a really small antenna that can receive power and transmit information back to the computer outside." The team recently started working with a group at Harvard Medical School to find ways to use this technology in medical implants. Together, they have the potential to design new devices to sense what is going on in the brain, stimulate different areas, and communicate important information back to researchers. But first, Lin will be flying to a reception in New York to receive his prize from NASA Tech Briefs: a high-end computer that can handle the complicated simulations his work requires. "This event is very special," Lin said. "They see the potential of this technology."